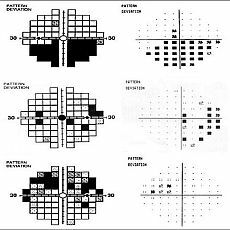 Assessment of the visual field searches deeper for deficits within the visual pathway.This involves the optic nerve ,optic tract ,and its radiations , tapping into nuclei (LGN) and finally the occipital or visual cortex. How is this relevant to your eye check up? Some people may have reduced vision, usually in one eye at first, and they quickly conclude the problem may be corrected with glasses. Umm… so much for that quick eye test. 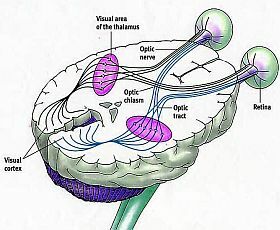 The problem however may lie with the entire pathway relaying the signal from the eye to the brain. Think of it as your phone line not working properly. It does not matter how pretty it looks ,it just is not working. So what can be uncovered? Our equipment can detect various conditions to list few; optic nerve damage from glaucoma, tumors, lesions, aneurisms which compress or damage the entire or part of the optic nerve pathway. When is this test indicated? Usually upon our suspicion there might be something wrong.